Join My Cleanse Challenge Group! We were made to do more than just survive. We were made for ABUNDANT LIFE through Christ! We were made to THRIVE! I am SO excited to be offering a CHALLENGE GROUP to do this 5-Day Cleanse with! So many of you had questions and asked about the recent cleanse that I just finished. Many of you said you’d like to do a cleanse yourself! Read the post about my cleanse here. Scroll down to watch a video where I discussed the cleanse also. I don’t know about you, but I don’t want to just survive. I want to thrive. And to thrive I need to feel my best. To live out the callings God has placed on my life I need to feel good physically, emotionally and spiritually. It is my hope and prayer that this challenge will encourage you in EACH of these areas! Also? This kind of thing is done better WITH FRIENDS. Y’all. I am offering this challenge BECAUSE I NEED THE MOTIVATION & ACCOUNTABILITY TOO. I have lost 26 pounds so far this year! Woot! But I continue to need to work on my health! It’s a journey, an ongoing process, I am not there yet! Beginning October 1st, we will be spending 2 weeks doing a WELLNESS CHALLENGE where we can encourage one another and help motivate one another in a closed Facebook group! 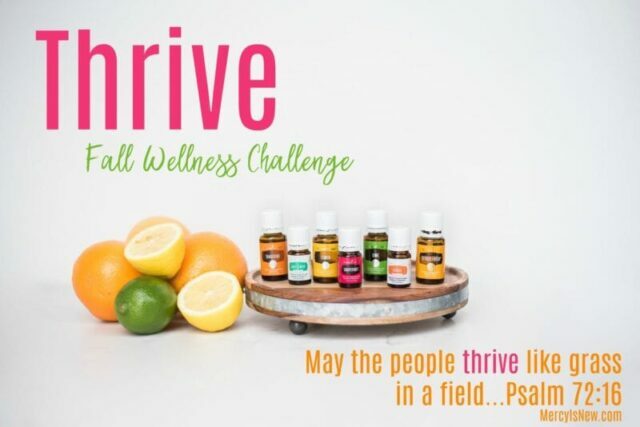 Invite a friend and let’s THRIVE together! We will be “meeting” in a closed Facebook group formally for 14 days. As soon as you place your order, however, and join my team, you can be added to the group immediately! Dr. Edie will be doing a teaching video on cleanses! Prizes & give aways & contests throughout the 2 weeks! I will be doing multiple Facebook live videos inside this group with encouragement, tips and support! We will have a group of people (already excited about this!) for accountability and support! We will have a BIBLE VERSE each day from October 1st-October 14th to read, meditate on and pray through. My heart is for us to cleanse our bodies not just physically but also spiritually! Phone Wallpaper with a Bible verse on it to keep you motivated! 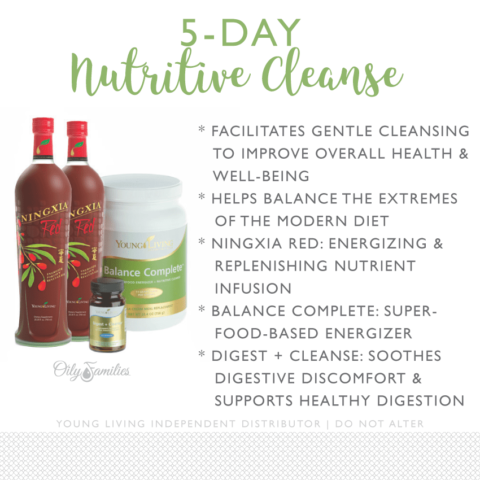 5-Day Nutritive Cleanse from Young Living (Read my blog post about my experience with this cleanse!) **See more options below if you don’t wish to do this particular cleanse! *If you’re already a member of my team and already have your Ningxia Red, just order the Balance Complete and Digest & Cleanse capsules. 1. Purchase the cleanse at retail cost without becoming a wholesale member. The cleanse, at retail cost, is $159.54. 2. OR, you can join as a wholesale member AND get the cleanse at the wholesale price for $161.25 AND when you join as a wholesale member with the cleanse I will GIFT YOU $20 back via PayPal! So, that ends up being CHEAPER than the retail cost! 3. OR, If you cannot do whey and wish to still join my wellness group with a juice or OTHER CLEANSE, you may still join as a wholesale member with another product line: essential oils, mineral make up, baby products, Ningxia or Thieves kit. Young Living also has other shake options! 4. Once you have placed your order, send me a message and I will get you added to the private Facebook group! 5. This challenge is for my current team members OR brand new members to my team. I am sorry I cannot open this up to everyone at this time. Put my member number in both boxes: 3387390. Next, choose your STARTER KIT. You can choose the essential oil kit for $160 and get started with oils AND the cleanse, OR you can choose the BASIC KIT which gets you the membership for $40. After you’ve chosen your starter kit, before you check out and pay at the bottom of the screen you will need to click “add more items” to your cart. At that point, I would go to the search bar under “products” and type cleanse in the search bar. Then click on 5-Day Nutritive Cleanse. Add to your cart. Check out as usual! Welcome! You are now a member of my team and the Oily Sisterhood led by Dr. Edie Wadsworth! Click here to become a retail OR wholesale member. The membership does NOT require a monthly purchase! AND then you will receive 24% off site wide. Wholesale membership perks: entrance to the Oily Sisterhood Facebook group led by Dr. Edie Wadsworth, ongoing teaching & videos from a doctor’s perspective, monthly oily newsletter, a support/encouragement group to ask all your questions in, you will save 24% off site wide. September 1-30 – ORDER your cleanse! Prepare your heart! October 7-14 – we will continue discussing WELLNESS and encourage one another toward good health in ALL areas of life!